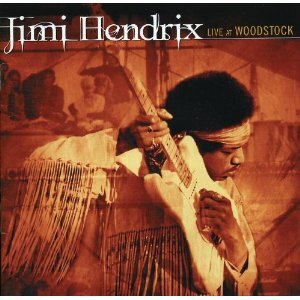 What most of us know about Jimi Hendrix at Woodstock is his blistering, wild, rendition of the “Star Spangled Banner,” played in front of the dregs of an August 18th Monday morning crowd. In actual fact, there were still 25,000 in Max Yasgur’s field–albeit a hell of a lot less than there were on the weekend–and Hendrix, the highest paid act of the show, played a 16-song set, which appears in it’s sequenced entirety on Jimi Hendrix Live At Woodstock. Taking the stage with a wholly new band (Jimi had recently broken up the Experience at the Denver Pop Festival eight weeks earlier), Jimi gave a ragtag group a performance that was not too well rehearsed and featured some loud rambling. The first of these two discs feature a simple “Hear My Train A Comin’,” with Jimi and Mitch chunkin’ along (to be fair the mix is pretty crappy here so we don’t hear much more than drums, guitar and vocals through-out). “Red House” is pretty much as perfect as you’d expect and “Spanish Castle Magic” rolls along nicely. “Jam Back At The House” starts off well enough, but kinda breaks up into pure discord near the half-way mark.